Although aging is universal, how we age is not equal. According to AARP, more than 10 million people aged 50 and above live in poverty in the U.S., and more than 37 million are just one life event away from slipping into it. Amongst those who are 65 and older, more than twice as many women as men live in poverty. The problem is even more acute for African American, Hispanic, and Native Americans. For this group of 50 million low-income Americans – many have not saved enough to sustain a living – social security is hardly sufficient. Coupled with that is the change in the three-legged stoolof retirement income, which was built upon a pension, social security, and personal savings. Unfortunately, employee pensions have become a thing of the past, replaced by 401(k) and defined contribution plans. According to the Bureau of Labor Statistics, however, roughly 55 percent of the American workforce has access to a 401(k) and only about 38 percent of the total workforce participate. 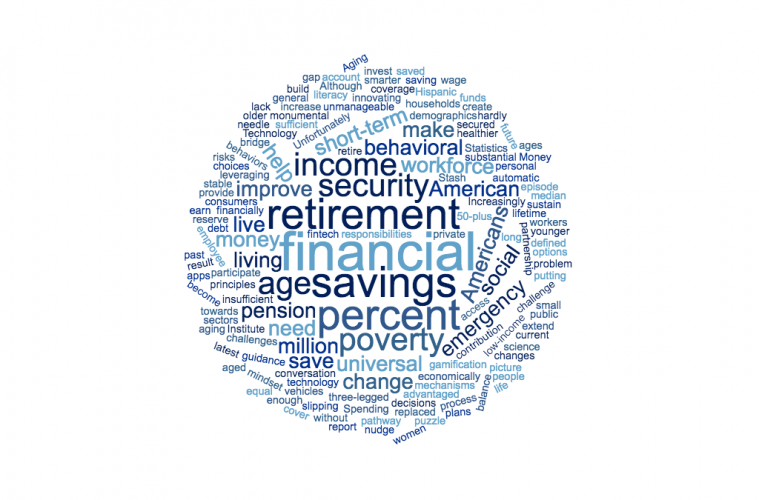 Adding to the challenge is the general lack of savings: According to the latest Aspen Institute report, the median retirement balance for households led by someone between the ages of 55 and 64 is only $14,500. That’s not nearly enough to sustain a year of retirement, let alone an extended one as societies are aging longer. Workers are now required to make their own decisions on how to save and where to invest, and as a result, bear more financial responsibilities and risks. Along the process, we have moved from “we know how much money we will get when we retire” to the current state of “we only know how much money we are putting away each year” – often without a clear idea of one’s financial picture after retirement. This puts more pressure on individuals as well as society. This is not sustainable. Faced with such monumental challenges, what can be done to improve the financial security for this group of demographics? For one thing, we know we need to help prepare people for retirement earlier. Increasingly, fintech apps are leveraging gamification and behavioral science principles to nudge consumers into healthier behaviors. Spending guidance and automatic saving mechanisms can help them make smarter financial choices, perhaps even build a small emergency savings reserve – as a pathway towards a more financially secured future. Money Lion and Stash are both good options to consider amongst many. Banks need to learn from the way startups approach these problems, and be a growing part of the solution. But technology and behavioral changes are only part of the puzzle. To move the needle on poverty will require partnership between private and public sectors, including vehicles to help workers earn a living wage and save more. It will also require a change in mindset, and a substantial increase in financial literacy that must begin at younger age. Not only do we need to extend retirement savings plans to provide coverage to all, we need to improve short-term savings, and develop ways to create a more stable lifetime income. With over 50 percent of low income 50-plus not having sufficient funds to cover short-term emergency, and 29 percent with unmanageable debt, we have a long road ahead. Listen in to our conversation with Paolo Narciso, VP AARP Foundation, on our next episode of Shades of Grey, as we talk about innovating for the less economically advantaged.